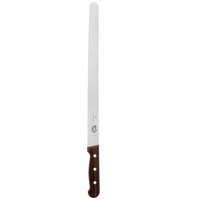 Slice with precision with this Dexter-Russell 29353 V-Lo 12" scalloped roast slicing knife! 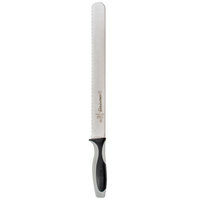 Ensure smooth, skillful slicing while you prep meats with this Dexter-Russell 29353 V-Lo 12" scalloped roast slicing knife! This knife boasts a comfortable, ergonomic design that is easy to hold. It meets all health code standards and is perfect for use in restaurant and catering kitchens. 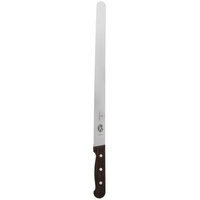 "This knife is primarily used to slice brisket, and does so very smoothly and efficiently. The knife is very sharp and maintains a fine edge through multiple uses. I have looked many places and this is also the lowest price that I have seen." 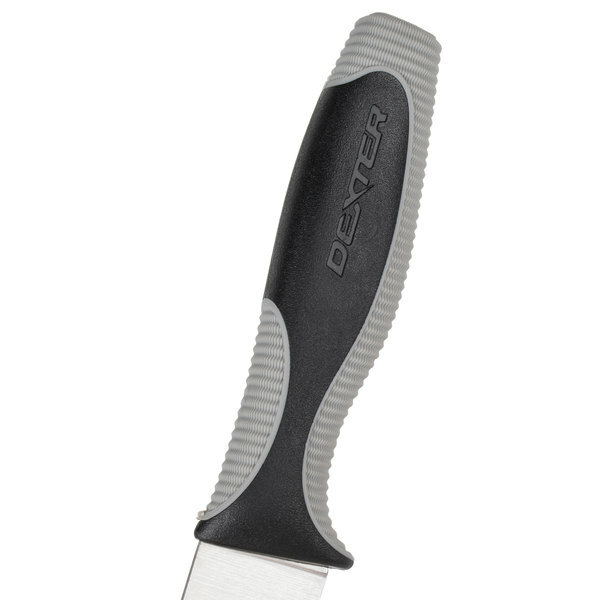 Featuring Dexter-Russell's Dex-Tex Armadillo textured handle, this attractive knife provides each user with a firm grip, ensuring safe, accurate cuts. Made with a high-carbon, stain-free steel blade, the knife is individually ground for a long-lasting, sharp edge and is made strong to withstand daily use. This knife's scalloped blade is perfect for cutting through tough skins. At the same time, a curved, protective finger guard reduces accidental injuries. Can this knife be washed in a dishwasher? No, hand washing with soapy water and sanitizer solution is always recommended. When placed in a dishwasher, the process will often rust and cause damage to the edges of the blade. These Dexter Russell Slicing knives make cutting through bread and meat quick and easy. A variety of styles means these knives are sure to meet all your cutlery needs. Check out this informational video to learn more! Alina Eisenhauer (Owner of Sweet Dessert Bar, Worcester, MA): Running my own restaurant every day and competing on nationally televised food shows, having the right tools is the most important thing. When I’m in the kitchen, the brand of knife I use the most is Dexter. With a quality design and ultimate sharp edge, Dexter is the best knife on the market for pros like me. Culinary school teaches you skill, but you’ll always stay sharp in the kitchen with a Dexter knife. Narrator: Dexter has a slicer for every task in your kitchen. They range in length from 10 inches to 14 inches, and feature different edges such as the honed straight edge, duo-edge, and scalloped edge. Straight, or plain, edges are designed to cut without tearing or shredding, while the duo-edge adds alternating cullens, or hollow, ground ovals that allow air and juices to enter the cut to reduce friction and make slicing easier. Eisenhauer: With Dexter’s final cutting edge, these slicers are great for cutting meat. The edges are super sharp, long lasting, and thanks to superior edge geometry, they’re really easy to sharpen. 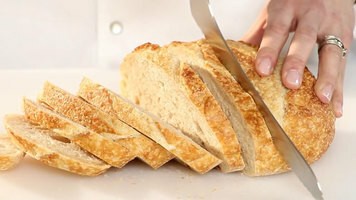 Narrator: Knives with scalloped blades feature many curved edges protected by sharp points that help to break through bread’s hard crust. As these points break through, the curved edge slices the soft interior without damaging it. 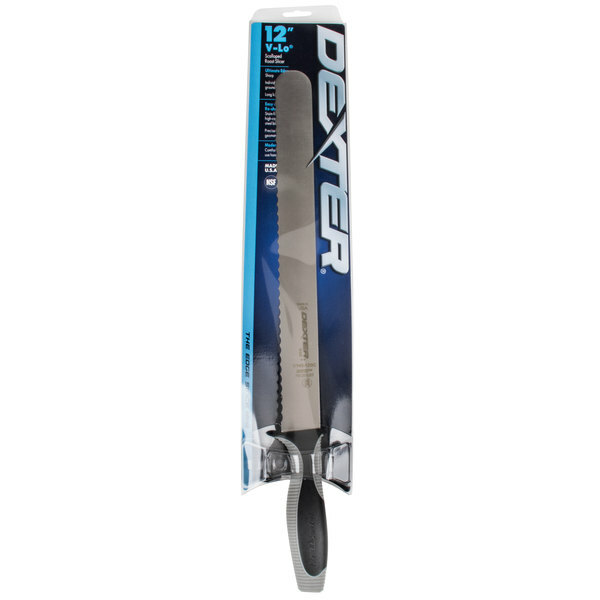 Dexter bread knives come in lengths from 8 inches to 12 inches, and feature straight, curved, and offset blades. 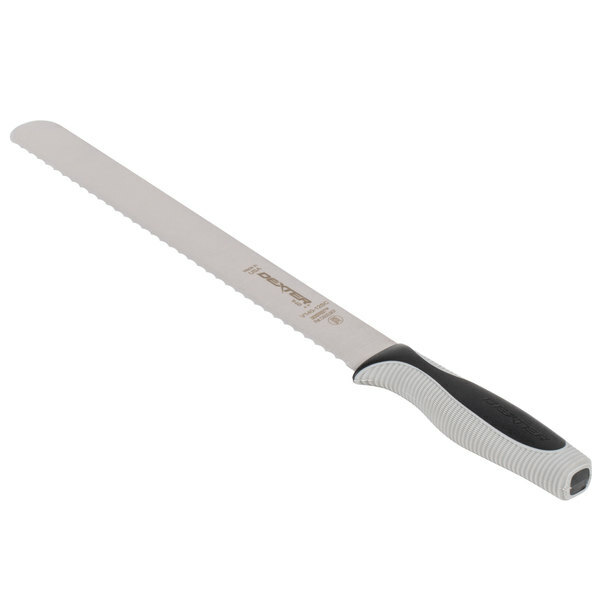 Eisenhauer: With an offset handle, I can cut completely through a loaf of bread, or a sandwich, without my working hand ever coming in contact with the cutting board. This really is my favorite knife. Whatever the task, Dexter gives me the edge, with better quality, comfort, and durability. Narrator: Dexter slicers are tough, kitchen tough. Our exclusive DEXSTEEL™ enhances sharpness, performance, and corrosion resistance. Dexter knives are sharp out of the box, and stay sharp, and they’re easy to re-sharpen, even after significant use. Eisenhauer: Dexter knives are comfortable in my hand. They’re perfectly balanced so my wrist doesn’t feel fatigued. Narrator: Find your favorite grip among the handle choices, like Dexter’s most popular Sani-Safe®, V-Lo®, DuoGlide®, and SofGrip™ options. If you prefer a forged knife, consider Dexter’s Connoisseur® or iCUT-PRO™ lines that deliver balance, performance, and style. All of these product lines are NSF certified. When you hold a Dexter knife, you’ve got nearly 200 years of cutlery knowledge in the palm of your hand. Dexter is the industry leader because of a commitment to producing quality, American-made knives that perform day in, and day out. Eisenhauer: My business, my life, my passion, it’s all cooking. So, I stay sharp with Dexter knives. Narrator: Dexter is the largest manufacturer of professional cutlery in America. Our Southbridge, Massachusetts factory has produced the finest quality cutlery and technological advancements since 1818. We take pride in every knife we make. That’s why each knife we produce is tested for quality and performance before it reaches your hand. Alan Peppel (President and CEO of Dexter-Russell): If you use Dexter products, we thank you. We hope we can be your product solution. At Dexter, we’re not the best because we’re the oldest in America, we’re the oldest in America because we’re the best. 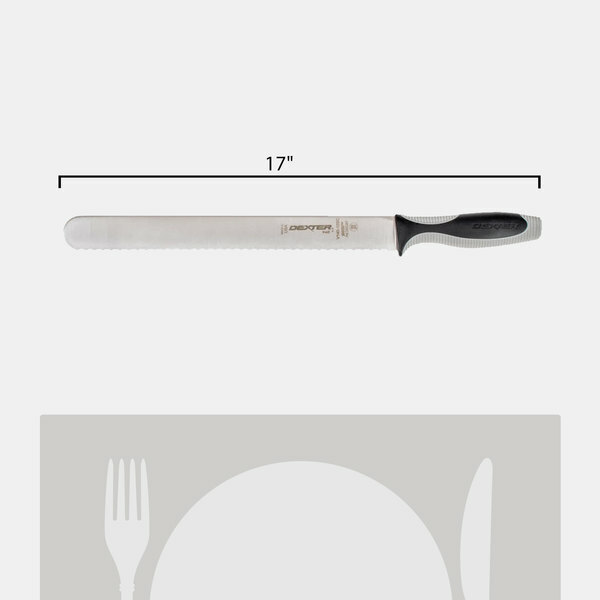 This knifes are perfect for steaks cuts very good quality, we fully recommend this knife We receive the order on time. Fair price for this product. Bought this knife for slicing brisket at the first wedding I catered. LOVE IT!!!! Very sharp knife that has kept it's edge very well. Makes quick work of brisket!!! Very sturdy knife and feels good in hand. I'll be buying a straight blade to compliment this scalloped blade. 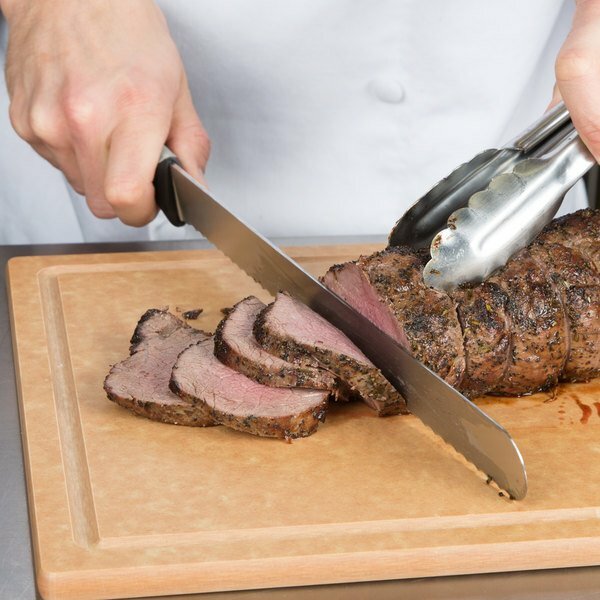 This is our Chef's favorite knife for cutting Prime Rib. Comfortable grip handle. Great price too. I would highly recommend this product to anyone needing to slice a big piece of meat. 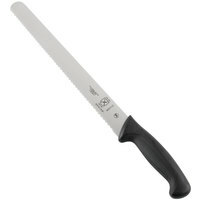 Used the Dexter-Russell 29353 V-Lo 12" Scalloped Roast Slicing Knife to cut off breast crust. The crust came off so easily. Nice to have a good knife. Arrived right away. This knife is primarily used to slice brisket, and does so very smoothly and efficiently. The knife is very sharp and maintains a fine edge through multiple uses. I have looked many places and this is also the lowest price that I have seen.